Features: ·Extremely resistant thanks to anti-shock technology ·Hollow frame with middle-ribbed structure ·Double lining made from polyurethane foam ·Double external layer made from EVA foam ·Separate accessories case. Description: An essential accessory for transporting your valuable notebook. The inner pockets are made from ZEROSHOCKÂ®, a material that protects your notebook effectively against damaging impact. The notebook covers are also ideal for use in normal travel bags, for example. The inner pocket fits perfectly into the stably constructed carry and travel bags. These protective covers also offer sufficient storage space for documents and accessories. The ideal transport medium for any notebook. 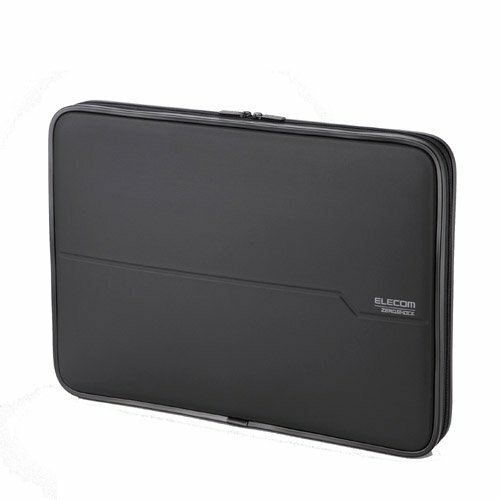 This case has a newly developed hollow frame with a middle-ribbed structure, which effectively absorbs impact against surfaces. Its double lining is made from light polyurethane foam that defends against impact and a double external layer made of EVA foam that absorbs impacts against the sides from all directions. Elecom has tested this ZEROSHOCK material with anti-shock technology and, unlike normal polyurethane, the low-resilience polyurethane can withstand impacts of 130-200 grams when hit on a surface by a falling weight of 1 kg. The sides can withstand impacts of 25-80 grams when hit by the same 1 kg falling object.